Learning how to accurately interpret facial expressions isn't easy, but it can make you a more effective leader. Eric Goldfarb knows that tuning into body language and facial expressions can indicate the thoughts and feelings that remain unspoken. He also knows how difficult those nonverbal cues can be to interpret. During a budget meeting with a direct report while working for Global Knowledge, Goldfarb noticed that his vice president kept toying with her necklace. He thought this mannerism was an indication of her discomfort with the financial target he was proposing. He also noticed her eyes and thought they expressed worry over the budget target. He repeatedly asked her during the meeting if she thought she could meet the budget, and even though she consistently answered yes, Goldfarb didn't believe her. So he scheduled a follow-up meeting with her to dig deeper. She ended up meeting the target without a problem, and Goldfarb realized that he wasted his and her precious time by scheduling the follow-up meeting and by dragging out the first one with repetitive questions. What could Goldfarb have done differently to more accurately size up his vice president? Goldfarb, now the CIO of auditing firm PRG-Schultz International, was astute to tune into her body language and facial expressions. However, because body language can be misleading and because facial expressions can be hard to read if you're not practiced at it, Goldfarb needed to more pointedly probe his direct report. Instead of continually asking her, "Are you comfortable?" he might have said, "It's really important for me to have your buy-in on this target. I don't mean to pry but I just want to know if the discomfort you appear to be showing is a result of this budget target or something else. If it's the target, we can work something out." Had Goldfarb taken this tack, he wouldn't have had to worry that his incessant questioning sent a message to this individual—one of his key lieutenants—that he didn't trust her, or that he temporarily lost some credibility in her eyes. Accurately interpreting the meanings of nonverbal communications, especially facial expressions, can make CIOs more effective leaders and managers, says Paul Ekman, noted psychologist and author of Emotions Revealed: Recognizing Faces and Feelings to Improve Communication and Emotional Life. Reading facial expressions is a particularly useful skill for business executives because, so often in business settings, people don't say what they really think. If CIOs could recognize how different emotions manifest themselves on the face, they'd be able to discern much more quickly, for example, when an individual is starting to get angry. They'd also be able to identify when people are trying to conceal their emotions—such as fear, contempt, disgust or surprise. This knowledge and ability can make CIOs more aware of unspoken political tensions in board or executive committee meetings. It also better equips them to handle sensitive staffing situations such as performance reviews. Ekman points to research indicating that managers who seem responsive to the unspoken emotions of their staffs are more successful in the workplace than managers who don't. "So much of our job [as CIOs] is spent selling things—ideas, budgets, influence. Becoming sensitive to the meanings of facial expressions, while tricky, is a way to find out very quickly who's allied with you and who might be angry with something you said," says Goldfarb. If you want to know whether or not the smile the CEO is giving you is sincere or whether the CFO is contemptuous of you when you make a proposal, keep reading. While facial expressions can be hard to decipher because they're fleeting (lasting anywhere from less than one-half of a second to three seconds) and because people often try to conceal them, they are in fact the clearest indicator of what someone is feeling, says Ekman. "The face is the only system that will tell us the specific emotion that's occurring," he says. That's because each emotion has unique, identifiable signals in the face. Emotions manifest themselves in facial expressions because, says Ekman, it became useful over the course of human evolution to let others know when we sense danger. Facial expressions have since become automatic. Because each emotion has unique signals in the face, facial expressions are more reliable indicators of a person's emotional state than body language. Ekman says you can learn the fundamentals of reading facial expressions in about an hour using an interactive CD-ROM he has put together that's available on his website, www.paulekman.com. You can also learn to read facial expressions in others by getting to know how emotions appear on your own face. Ekman advises individuals to look in a mirror and remember a personal experience that made them angry, sad, fearful or disgusted so that they can see how their expression changes as the emotion washes over them. This exercise will help you recognize muscle movements that are the clearest indicators of a particular emotion. 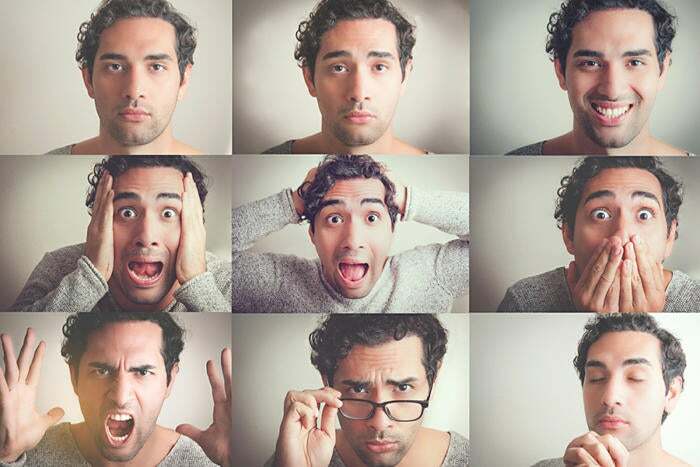 Once you've learned to automatically and accurately recognize the meanings of different facial expressions, you can decide whether and how to act on the information you obtain from reading faces. For example, if you pick up on signs of anger (thinned lips, lowered eyebrows, and raised upper eyelids) when telling a staff member that she did not get a promotion, and if you care about the staff member and want to see her advance, Ekman suggests that you might say to her, "I know that was bad news and I expect it was disappointing. I had the impression you were upset and wondered if it would help to talk about it," or simply, "I would be glad to talk to you now or at a later time about how you feel about it." Ekman cautions against asking a person in this situation if she is angry because it opens the CIO up to an attack. If the staff member shows fear (raised upper eyelids, tensed lower eyelids, with eyebrows raised and drawn together), Ekman says her expression may suggest that she is concerned about her future. Ekman advises supervisors to reassure the person about her standing in the company if it's not at risk, or to discuss the areas in which the individual needs to improve. Ekman says that, while studying facial expressions, it's important to keep in mind that they do not reveal what is generating the emotion, only that the emotion is occurring. Yet, he continues, "If we are sensitive to the expressions of another person, then we know what impact we're having on them and what emotion they might be trying to conceal." In other words, we're a lot better off when we pay attention to and know how to assess these cues than when we're oblivious to them.